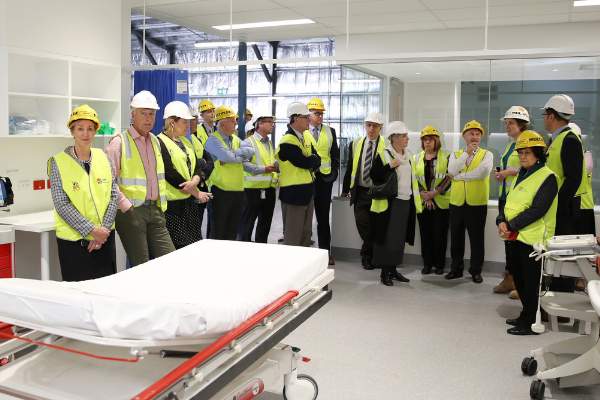 The board enjoyed a tour of the facility on September 11, while executives from Westmead Hospital, The Children’s Hospital at Westmead, the University of Sydney and Multiplex popped in on September 12 to view the rooms. The prototype rooms, designed to be identical replicas of some of the spaces inside Westmead’s new hospital building, have been under construction for several months and are now almost ready for visits by project user groups, consumers and the broader precinct community. Westmead Hospital general manger Brett Thompson, who visited the space last week, said the rooms were a great opportunity for staff and students to orientate themselves with the new building. “We’ve seen the construction work and looked at artist’s impressions of patient rooms and other spaces, but this is a chance for people to actually stand inside a replica operating theatre or staff station and get an understanding of what it will look like in the new building,” he said. “It’s also a great place for services who are moving into the new building to test out their new models of care and for our more senior staff to offer education and training to students. The prototype rooms will open their doors to all staff, patients, visitors, researchers and students in October. “Sticky-beak week” – the open prototype room viewing sessions – will be held on October 2, 3 and 4 from 12pm – 2pm and 3pm – 5pm at the prototype rooms, located on Dragonfly Drive, near Redbank House. To register for a session, contact WSLHD-WestmeadProject@health.nsw.gov.au.